Israel’s incumbent Prime Minister Benjamin Netanyahu is on course for a record fifth term, election results show. Netanyahu, 69″It is a night of colossal victory,” told supporters at Likud headquarters. The Likud party with the help of other right-wing parties are likely to muster enough support to get a majority in the 120-seat parliament, known as Knesset. “It is a night of colossal victory,” Netanyahu, 69, told supporters at Likud headquarters. Likud party and the centrist Blue and White party led by Netanyahu’s main rival Benny Gantz tied at 97 percent of votes counted. The two main parties won 35 seats apiece. Likud, which gained five more seats compared with the 2015 elections, needs 61 seats to form the government. 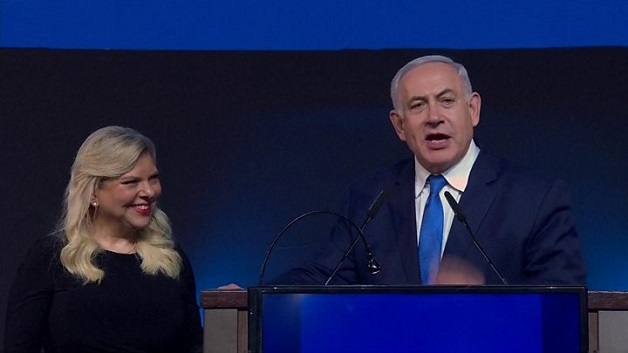 Netanyahu and his main challenger Gantz were quick to claim victory in the elections. “The skies may look overcast … but they cannot conceal the sun of hope that we have brought to the Israeli people and society,” Gantz, 59, wrote in an open letter.